Based on the biographies of some three hundred people in each city, this book shows how such distinguished Boston families as the Adamses, Cabots, Lowells, and Peabodys have produced many generations of men and women who have made major contributions to the intellectual, educational, and political life of their state and nation. At the same time, comparable Philadelphia families such as the Biddles, Cadwaladers, Ingersolls, and Drexels have contributed far fewer leaders to their state and nation. From the days of Benjamin Franklin and Stephen Girard down to the present, what leadership there has been in Philadelphia has largely been provided by self-made men, often, like Franklin, born outside Pennsylvania.Baltzell traces the differences in class authority and leadership in these two cites to the contrasting values of the Puritan founders of the Bay Colony and the Quaker founders of the City of Brotherly Love. While Puritans placed great value on the calling or devotion to one's chosen vocation, Quakers have always placed more emphasis on being a good person than on being a good judge or statesman. 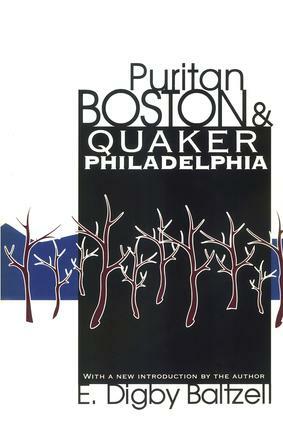 Puritan Boston and Quaker Philadelphia presents a provocative view of two contrasting upper classes and also reflects the author's larger concern with the conflicting values of hierarchy and egalitarianism in American history.